And I do… I know quite a few actually. The city are well proportioned with good modern pubs, that serves international bottled beers and a lot of new microbrewery stuff on tap. I believe this bar is one of the greater ones. 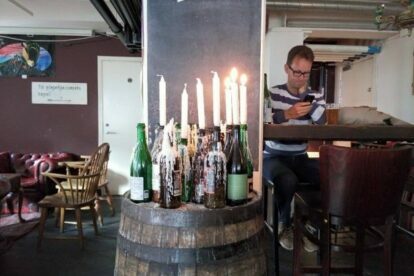 Fantastic beers on tap, which is often exchanged with new fantastic beers; one big, dark(ish) and cosy room with candlelight’s and couches; an outside area with lots of activity; friendly and interesting staff – plus, it’s quite hidden away from the public areas. A good tip is to ask for a taste before buying the one you desire. As a local I often look for the many new arrivals and try something new each time, but it’s difficult to keep up… Challenge accepted!